Elisa Whitman began her law career at a large firm in Baltimore, Maryland, where her practice focused on business and real estate transactions. She represented individuals and all types of business entities, including not for profit organizations. Upon relocating to Rockford with her family in 1994, she continued her practice, emphasizing business guidance and succession planning. Elisa is a member of the Winnebago County Bar Association and Illinois State Bar Association. Elisa has been actively involved in local community service organizations since her arrival in Rockford. 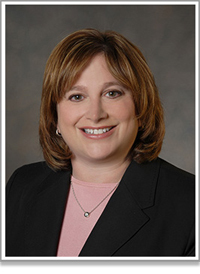 She has served as president and in various capacities on the boards of directors of the Winnebago County Medical Society Alliance, the Rockford Health Careers Foundation, the Alliance for Community Health, Hadassah, and Temple Beth-El. She now serves on the board of directors of the Winnebago County Bar Association and has served as chairman of its Commercial Law Section. In 2016 she served on the strategic planning committee for gifted education in the Rockford School District. Elisa has four children. She enjoys traveling, listening to Bruce Springsteen, and spending time with her dogs and twin granddaughters.